This easy to make cauliflower rice recipe will blow your taste-buds away and I’m not joking. Cauliflower rice is the new mashed potato and versions of this dish are getting rave reviews all over the world especially from low-carb eaters who quit eating rice. Mrs.CBB is a rice quitter. I was a big skeptic when Mrs. CBB kept telling me you could turn cauliflower into mashed cauliflower which tasted just like mashed potatoes but better. I gave it a try last year and didn’t mind it at all although I’m a potato lover at heart coming from the UK where we ate lots of potatoes growing up. There’s nothing quite like a Sunday roast dinner with mashed potatoes, gravy, veg and Yorkshire pudding. Mrs. CBB was all fired-up to make this cauliflower rice likely because new recipes are exciting when you are limited with what you can eat. Armed with our kitchen-tools, a pot and cheese grater away we went. With the addition of cumin and turmeric along with Frank’s Red Hot sauce this cauliflower rice dish came together beautifully. Not only was the colour vibrant but it looks as delicious as the photo above. The texture of the cauliflower rice is similar to what rice would be so you don’t feel you are missing out if you want your daily rice fix. Since Mrs. CBB and I have complained about the price of cauliflower we haven’t purchased any recently as it’s not budget-friendly in Ontario. At almost $7.00 for one head of cauliflower my wife said she could do without the cauliflower rice, cauliflower cheese bake and cauliflower pizza that we’ve made in the past. Incidentally, in the summer when vegetables are in season this cauliflower rice recipe would certainly qualify as budget-friendly. It just so happened that her friend who is also on the same diet was at the grocery store and spotted cauliflower on the reduced rack for $0.99 so she grabbed a couple and gave one to my wife. The cauliflower literally made enough for this recipe. It wasn’t a large cauliflower by any means but it was enough for the two of us to enjoy a nice meal. My wife was all giddy about getting a cauliflower. Now I know what I’m getting her for Valentine’s Day, haha! When Mrs. CBB told me that you could make cauliflower rice I wasn’t surprised because cauliflower is so versatile. Many people who are following a gluten-free or low-carb diet also known as Atkins or Low-carb-high-fat (LCHF) diet dive into cauliflower rice dishes because it really does taste like you’re eating a bowl of rice. If you do happen to score a deal on cauliflower you can cut it into florets and toss it in the food processor. Once you process it into little rice looking bits you can freeze it. That way when you need to use it you’re ready to rock and roll apart from a quick boil unless you plan to bake it in which case you can simply use it raw as it will cook in the oven. We haven’t tested this recipe with frozen bagged cauliflower from the grocery store but I’m sure it would work just as well as long as you don’t over-cook the cauliflower when you boil it. Be mindful of any water in your cauliflower rice as you don’t want to put that in the frying pan. A quick squeeze to get out any water after boiling and grating will mean the difference between a successful stir-fry and a soggy stir-fry. We haven’t tried to freeze the boiled, grated cauliflower yet to see how it fares but we certainly will give it a shot once we find more deals on cauliflower. Apparently cauliflower has come down in price in Nova Scotia so hopefully that price drop will come our way soon. I’m sure many cauliflower lovers will be rejoicing to see a more manageable price on the vegetable so they can add it back into their menu plan. This cauliflower rice recipe will feed 2 people and has a net carb value of approximately 5.30g per serving or 10.63g for the entire recipe which is very low compared to what people eat who don’t look at carb count. The fats in this recipes that I used was 2 tablespoons of butter. I added some broccoli florets and sliced Italian sausage along with cumin, turmeric, salt, pepper and Franks Red Hot Sauce. For those of you who have never tried cauliflower you’ll be thrilled to know that it’s full of nutrients and used all over the world. Cauliflower is one of several vegetables in the species Brassica oleracea, in the family Brassicaceae. It is an annual plant that reproduces by seed. Typically, only the head (the white curd) is eaten. The cauliflower head is composed of a white inflorescence meristem. Cauliflower heads resemble those in broccoli, which differs in having flower buds. Brassica oleracea also includes broccoli, brussels sprouts, cabbage, collard greens, and kale, though they are of different cultivar groups. According to Mrs.CBB it’s nice to have variety in your diet especially when you cut the carbs which is why she is experimenting so much with low-carb recipes but with her signature twist. Give it a try, You’ll love it!! If you are a fan of rice but don't choose to eat it check out some of my amazing cauliflower recipes. Add florets to salted water and boil until just tender. Let cool. Use a food processor, cheese grater (which I did) or a knife to cut the cauliflower into small rice-like pieces. Squeeze any excess water out of the rice and let sit for 5 minutes to drain. 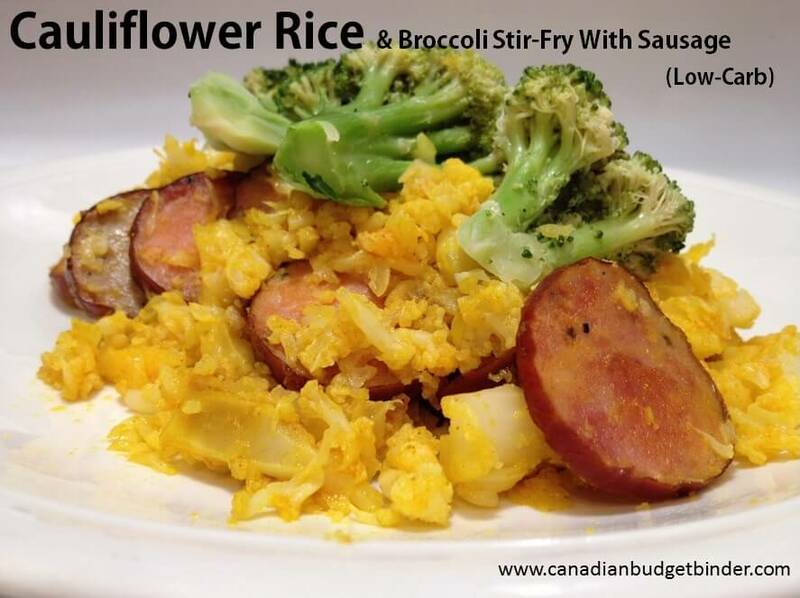 In a med-high heated pan add butter, cauliflower rice, pre-cooked sausage slices and stir-fry. Add the broccoli on top to steam as they are already par-boiled. Add hot sauce, turmeric and cumin then saute until the broccoli is tender and everything is hot. Plate up and top with broccoli and sausage. Dinner hasn't tasted so good! This cauliflower rice recipe was too delicious not to share today. Keep in mind that you want to get as much of the water out as you can so let it sit in the colander if you have to. If you want to freeze the cauliflower place in a container and freeze up to 3 months. What do you make with your cauliflower? I like that dish Mr. CBB, I cook sometimes and I am always looking for great recipes. I just had Hurst Beans. This does look mighty good!! Wonder if my sisters-in-law would be interested…they both watch their weight especially right now the older one with her daughter as my niece is getting married in November this year and they want to look good!! No idea which diet they are using this time around. It really does taste great and it’s nice to have something different once in a while.